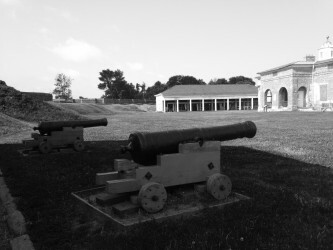 Attention, photographers: through the month of October, Fort Mifflin is hosting its first-ever photography contest. Submit your favorite shots in one of two categories–Color and Black & White–for the chance to win a FREE 2015 membership to the Fort. For more information, consult the contest guidelines below. The deadline to submit your entries is October 31, 2014. Happy shooting! The Fort Mifflin Photography Challenge (hereafter referred to as Contest) is open to all photographers. However, participants under the age of 18 must have written permission from a parent or legal guardian to submit an entry. Entries should integrate some aspect of Fort Mifflin (ie: the buildings and structures, the natural landscape, etc.) to be considered. Photographers directly affiliated with Fort Mifflin on the Delaware, including current employees, members of the Board of Directors, and the Olde Fort Mifflin Historical Society, and their immediate families (children, spouses, and siblings) are ineligible for the Contest. Participants can submit entries in each of the two categories (Black and White and Color); however, he or she may only win one prize. Photographs can be submitted to fortmifflininfo@gmail.com with the subject heading “Fort Mifflin Photography Challenge 2014.” Entries must be either .jpg, .gif, or .jpeg file format and not exceed 5MB. (Photographers must be prepared to submit a high-quality image if they are chosen as a winner). Please provide a full name and contact information (Address, Email, Phone Number) with your submission. Please note that no submissions with obscene, lewd, violent, provocative or otherwise questionable content will be eligible. Participants may submit cropped photos; however digitally or otherwise enhanced or altered photos will be ineligible. Use of corrective functions to improve the natural appearance of the image, such as levels, contrast, brightness, curves, intensity, tone, hue, saturation, lightness, value, color balance, and tint are acceptable. The deadline for submission for the Contest will be October 31, 2014. Winners in both the Black and White and Color categories will be announced on November 20, 2014. Winners will be determined by a panel of judges who will judge entries based on photographic quality and effective use of the Fort. The grand prize in each category will be a free 2015 Family-level membership to Fort Mifflin on the Delaware; a runner-up in each category will win a free 2015 Lieutenant-level membership. Winners are eligible to only one membership. By submitting an entry, you retain all rights for the photograph(s) you submit; however, you grant Fort Mifflin on the Delaware a royalty-free, nonexclusive right in perpetuity to use the image for its own purposes (promotional imagery, exhibition, social media, and other uses), including the right to alter the image,and grant Fort Mifflin on the Delaware permission to retain a digital copy of the image. Full credit for the photograph will be given to the creator in the form of the caption “Copyright <Person’s Name>”.